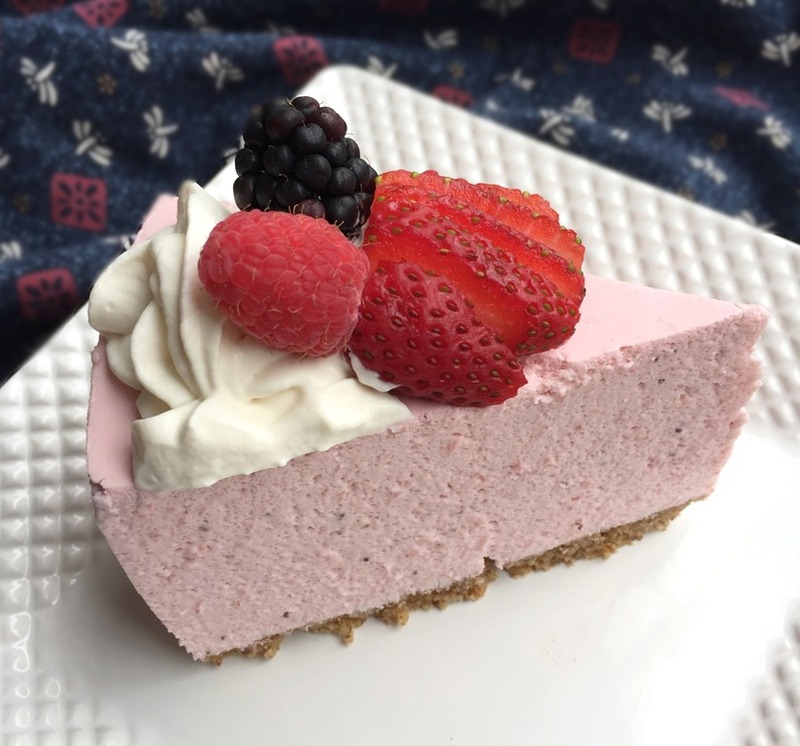 This sugar-free strawberry cheesecake may have just jumped onto my list of all-time favorite desserts, even those full of sugar. 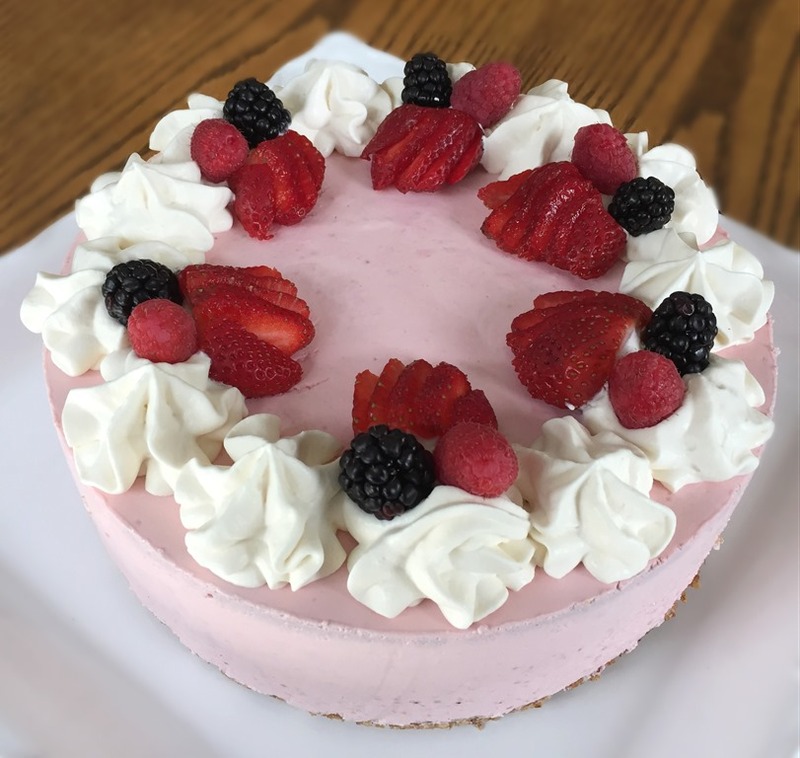 This is a no-bake cheesecake that is easy to put together. Made with fresh strawberries, it is a fabulous summer dessert that won’t heat up the kitchen. It is light and airy, not dense like a baked cheesecake. I sweetened it with stevia and erythritol, but you can easily substitute real sugar. But for those watching their carb and sugar intake, this is a wonderfully satisfying dessert. My kids don’t even miss the sugar! I made it in a 9” springform pan, and it completely filled the pan for a nice tall cheesecake. You could make it in a little bit larger pan instead if you don’t want quite as thick of slices. 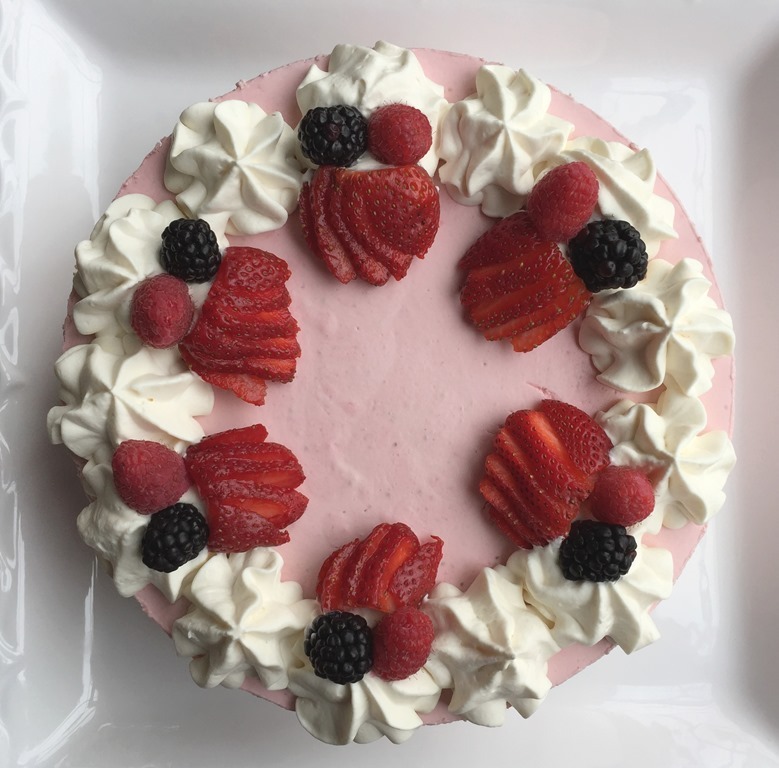 I garnished the cheesecake with some whipped cream and fresh berries. A wonderful light and summery dessert. Place almonds, pecans, and oats in a food processor; blend until finely ground. Add butter and stevia and pulse until combined. Lightly spray 9” springform pan with baking spray (I like coconut oil spray for this). Press crust mixture onto bottom of pan. Bake for 10 minutes. Cool completely. In a large mixing bowl, beat cream cheese until smooth. Add sour cream, vanilla, erythritol, and stevia and beat again until smooth. Place cool water in a separate bowl; sprinkle gelatin over water. Let sit for 5 minutes, or until gelatin has softened. Microwave for 15 seconds, or until gelatin has dissolved. Place strawberries in a food processor. Blend until very finely chopped (mixture will be slightly liquidy). Add gelatin mixture to food processor and pulse until mixed. Add chopped strawberries to cream cheese mixture and beat until smooth. Taste mixture and add additional sweetener, if needed. In a separate mixing bowl, whip 1 cup cream until stiff peaks form. Fold into filling. Pour mixture over cooled crust in the springform pan. Refrigerate for at least 4-6 hours or until firm. Combine cream, cream cheese, vanilla, and stevia in a mixing bowl and beat until stiff peaks form. Pipe onto top of chilled cheesecake and garnish with fresh berries. Welcome to No Empty Chairs! A blog about good food and good times around the kitchen table. I want all to come hungry and leave nourished, both at mealtime and in life. So please, pull up a chair and welcome to our table! Receive an email from No Empty Chairs when new posts are published.